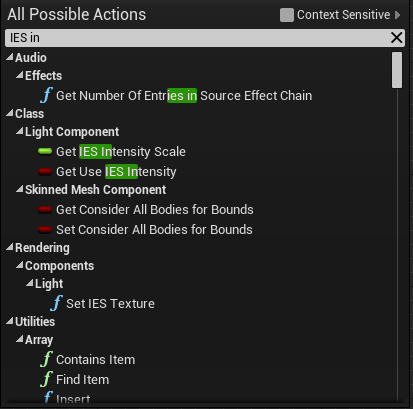 My lights use IES files, and I have checked "Use IES Intensity". I want to change the IES Intensity scale value in my Blueprint, but the only IES Intensity related node is for GET and not SET. How do I SET this value in my blueprint? +1, I would also like to know the answer to this one. Did you ever get this figured out, having the same issue. Unfortunately the IES intensity scale is not exposed to blueprints. You could however still adjust the lights main intensity and also use set visibility with blueprints.